International Women’s Day was Thursday, March 8, 2018. 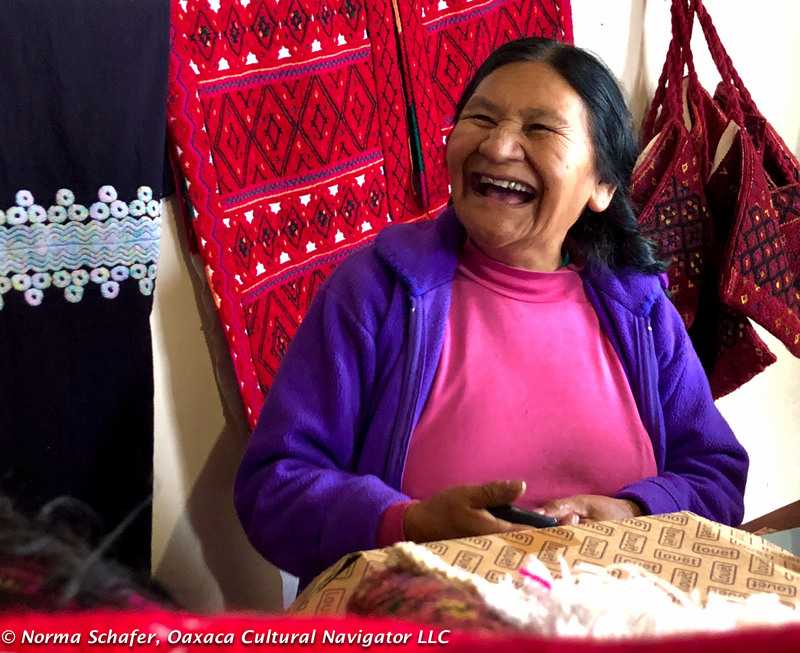 It’s days later and I now find time to acknowledge, honor, recognize, applaud some of the women we met along the way during our two back-to-back Chiapas Textile Study Tours in February and March this year. I don’t know all their names. 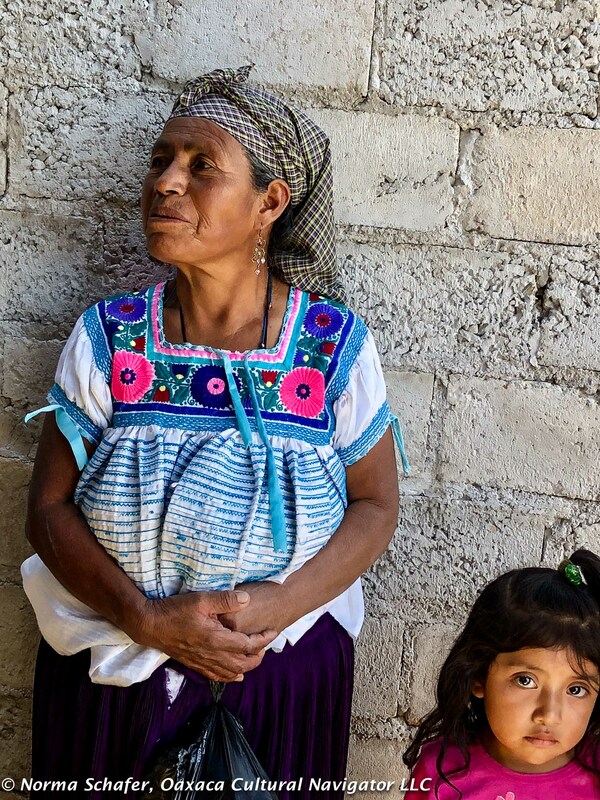 Their hands, feet and faces are universal stories of women who work hard with little recompense. 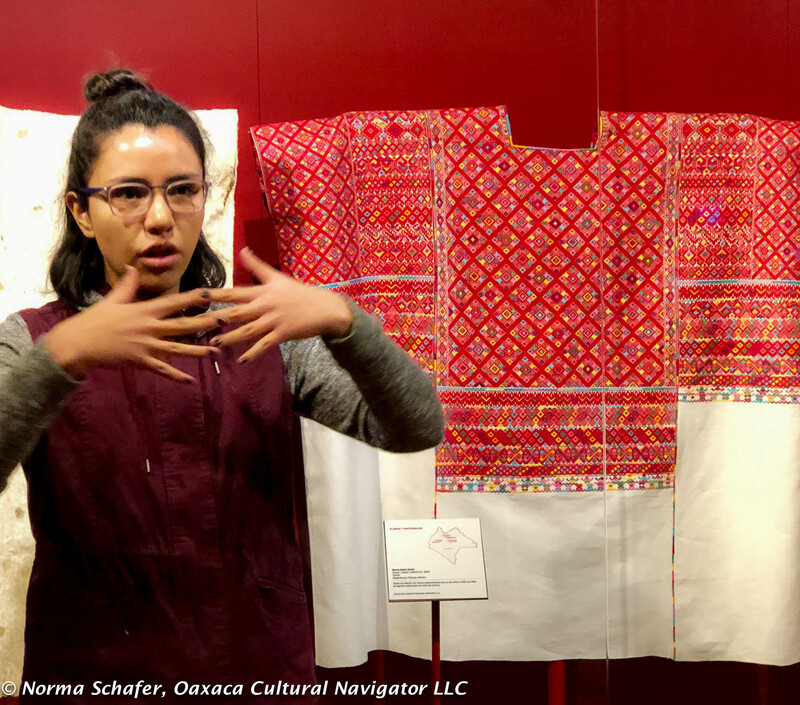 Their garments tell the stories of culture, history, creativity and subjugation by Spanish conquerors who imposed clothing style as indigenous identifier. Most are women who weave or embroider. 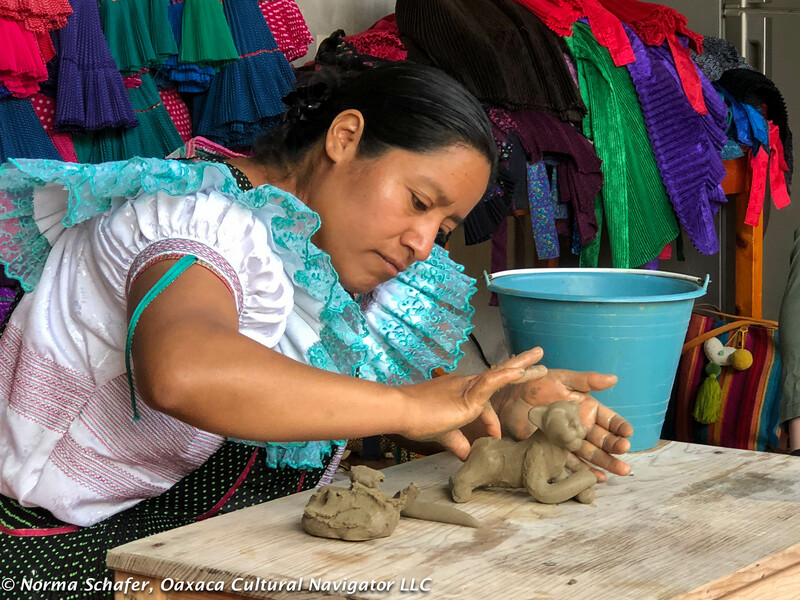 Some are women who craft pottery — cooking vessels and decorative jaguars, many of them life-size. A few are famous. Most are not. They are mothers, daughters, grandmothers, aunts, cousins, nieces. 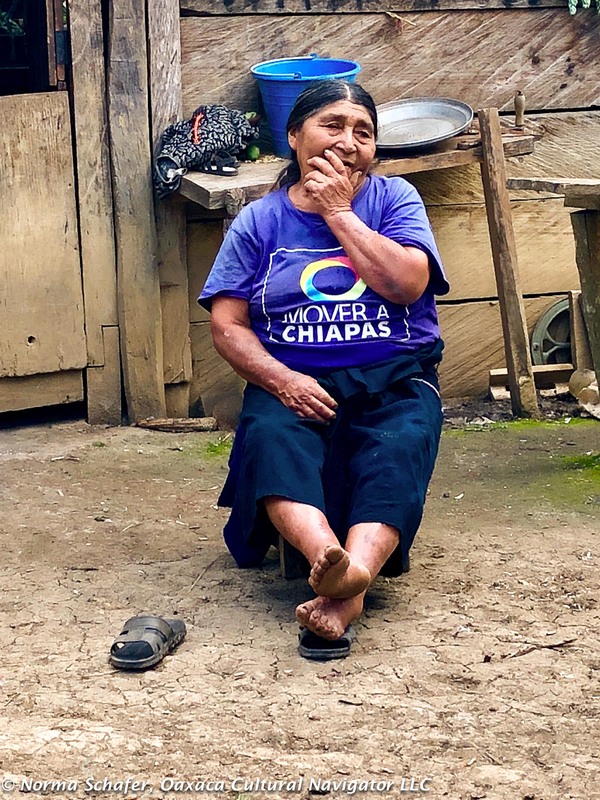 Some, like Rosa and her husband Cristobal, participated in the 1994 Zapatista uprising to stand for indigenous rights. The movement paved the way for a stronger voice for women. They carry babies on their backs, harnessed by robozos. 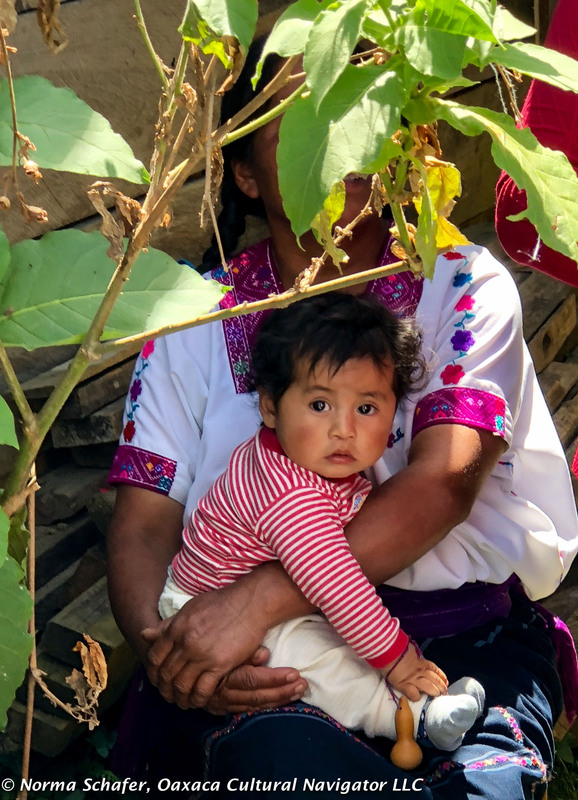 They use rebozos shifted to the front of their bodies so infants can suckle. 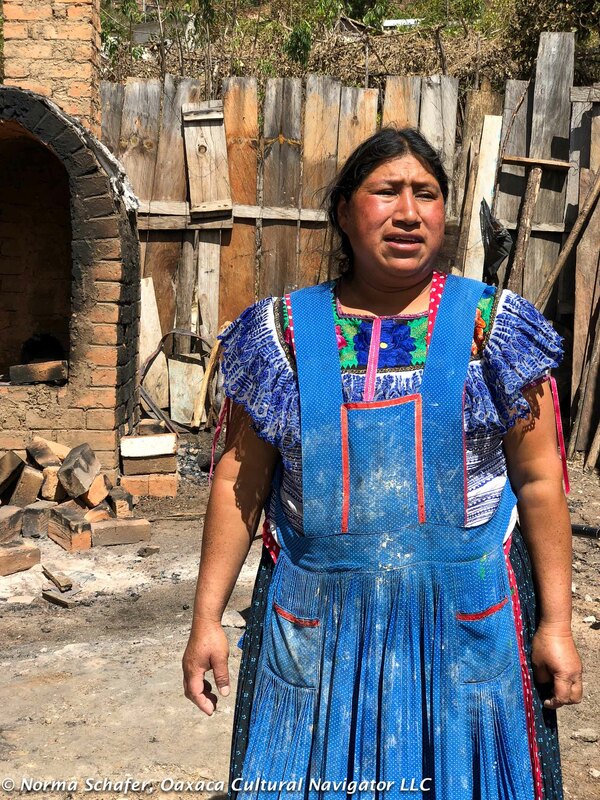 They use rebozos to carry market vegetables and fruit to the cooking fires. Few are professionals like Lourdes who translates Spanish to English for us, educated in sophisticated cities far away. 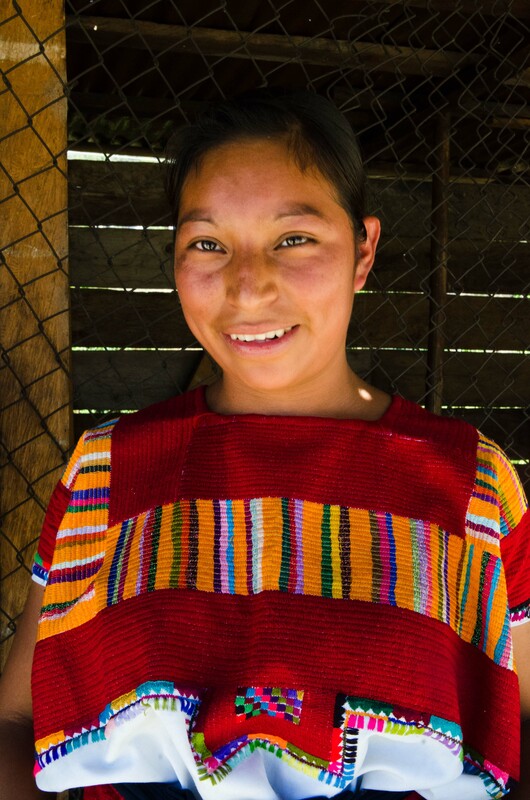 Others head cooperatives, organizing the business of textile making and selling to sustain families. Some are faceless. We see their progeny. A few are expats from Italy, France, Canada, the United States or Japan, who migrate to the promise land. 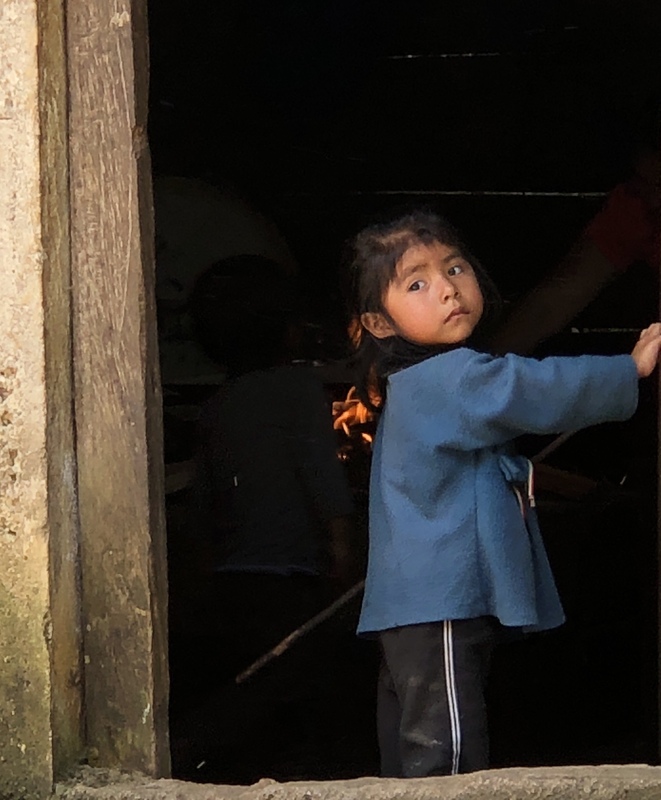 We see hands making tortillas, tending the cooking fire, soothing a child’s cry, serving a husband dinner. Most of all, we know that women’s work begins early and ends late, is continuous, often self-less and usually in the service of others. Take a moment to consider what women around the world give as we regard those whose photos we see here. Take a moment to give thanks to all the women in the world. We are more similar than we are different. What will become of the next generation of women? 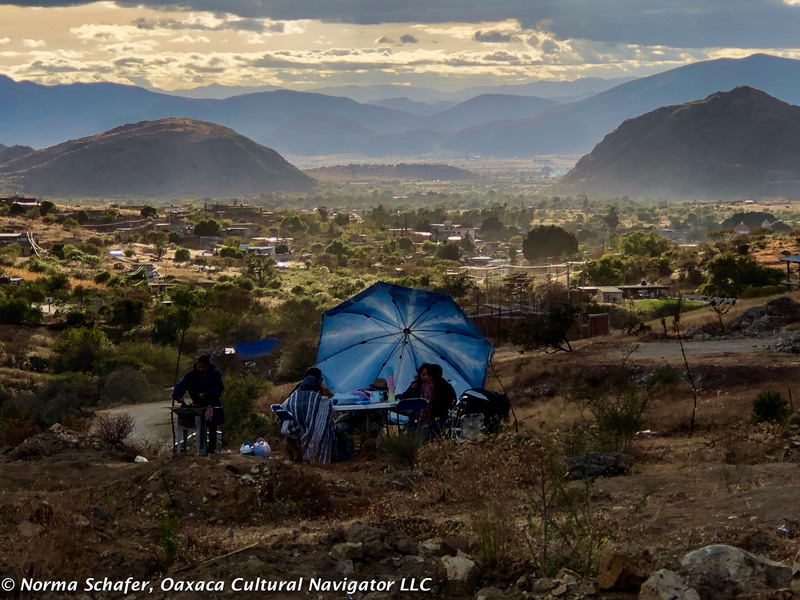 Oaxaca and Chiapas have a lot in common. 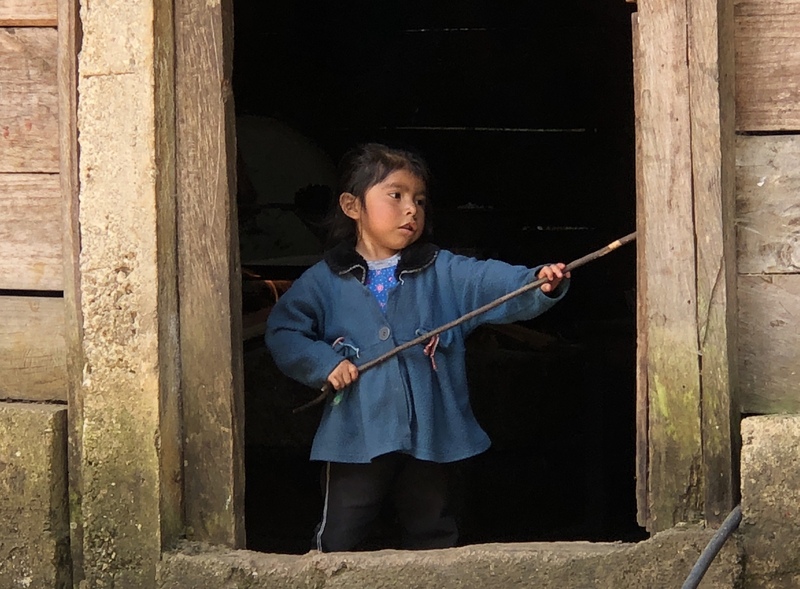 They are the two poorest states in Mexico, have the lowest literacy rates and in the rural areas there is little or no access to health care. 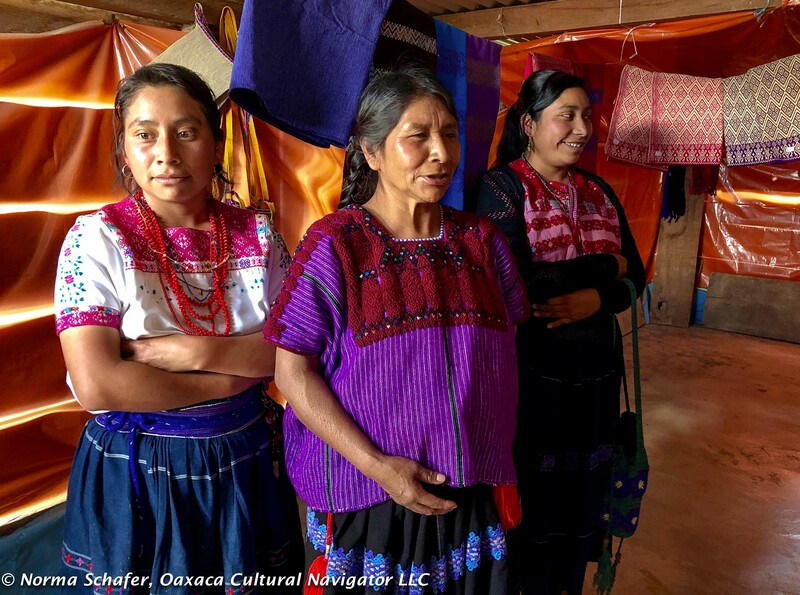 Chiapas and Oaxaca have the highest percentage of indigenous people in Mexico, yet they are under-represented in politics and business, lack access to education. Because of the rural character of each state, people are isolated and removed from the mainstream. 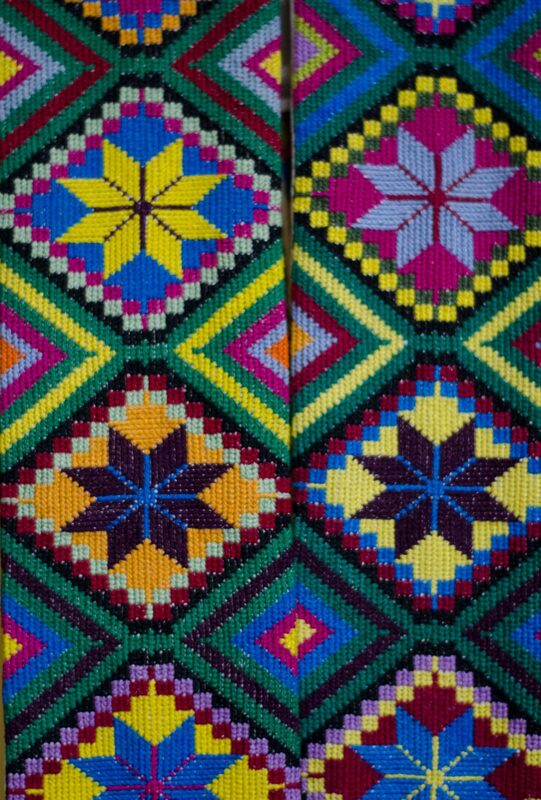 They produce some of the most exquisite textiles in all of Mexico. 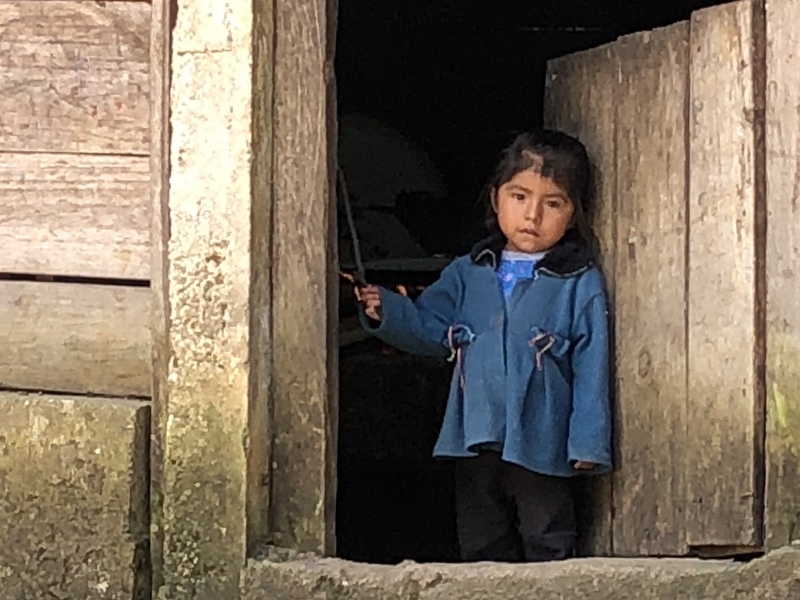 For this entire time in Chiapas, I am using only my iPhone 8Plus with zoom lens. All the photos you’ve seen since February 12 are from my portable device with very little editing. I’m a devotee. Thinking of selling other equipment! Thank you for following this adventure. There is more to come. 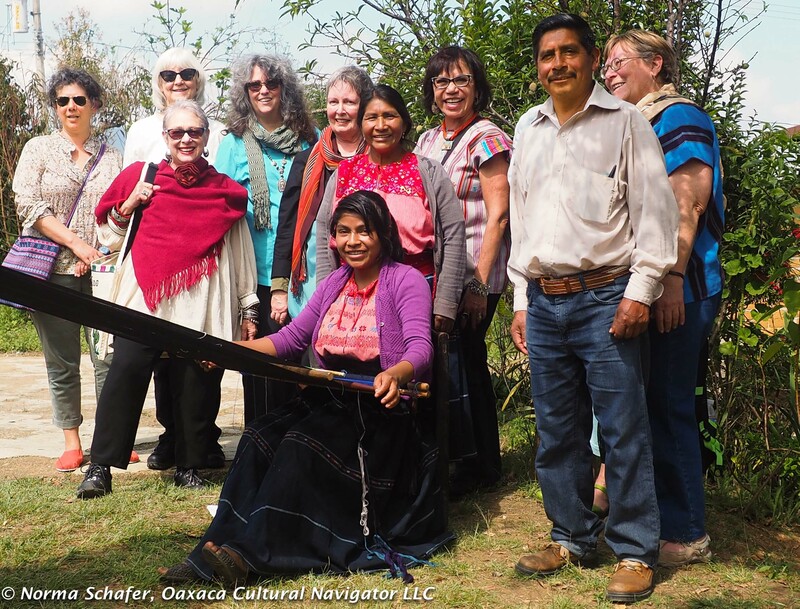 Our Chiapas Textile Study Tour Group 2 starts this coming Tuesday evening. 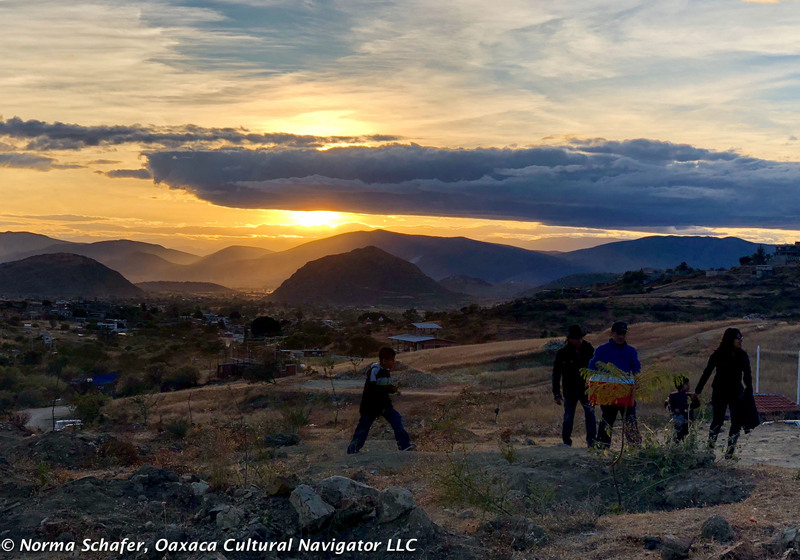 I am an admirer of Eric Mindling who has, over his 30-year relationship with Oaxaca, documented her people with glorious photography, and introduced many travelers to regions far off-the-beaten path. 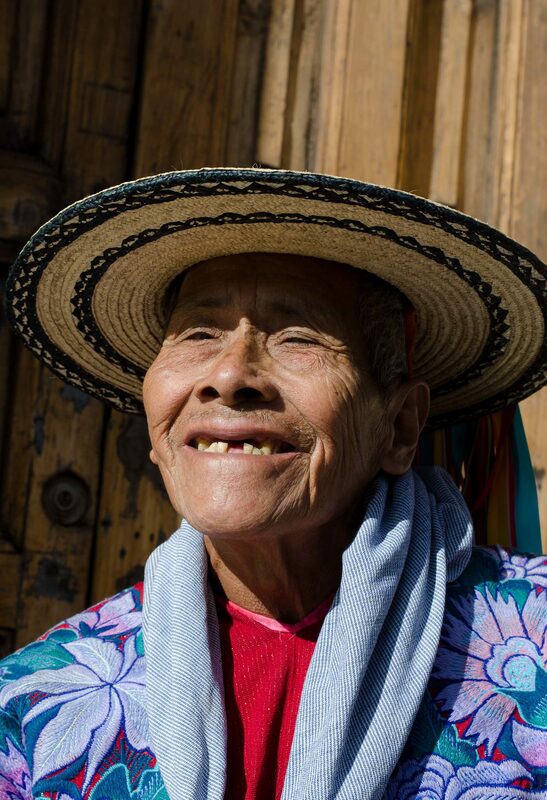 Thank you for this beautiful tribute to life, the grandparents, culture, survival and identity. It gives us pause to think about whether we are sagebrush or tumbleweed — and what we appreciate. I hope you enjoy and share. 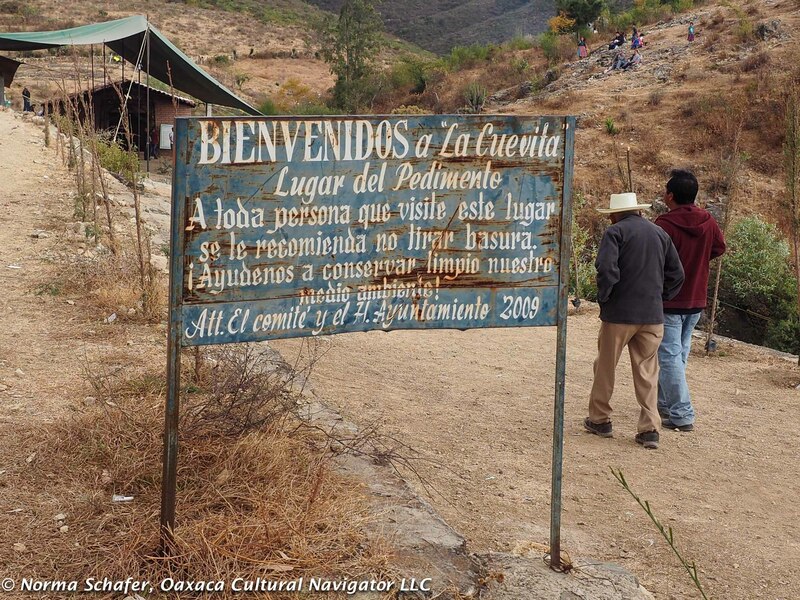 Beyond the town’s paved roads, back into the hills far from the village center, is the sacred site Teotitecos call Las Cuevitas. 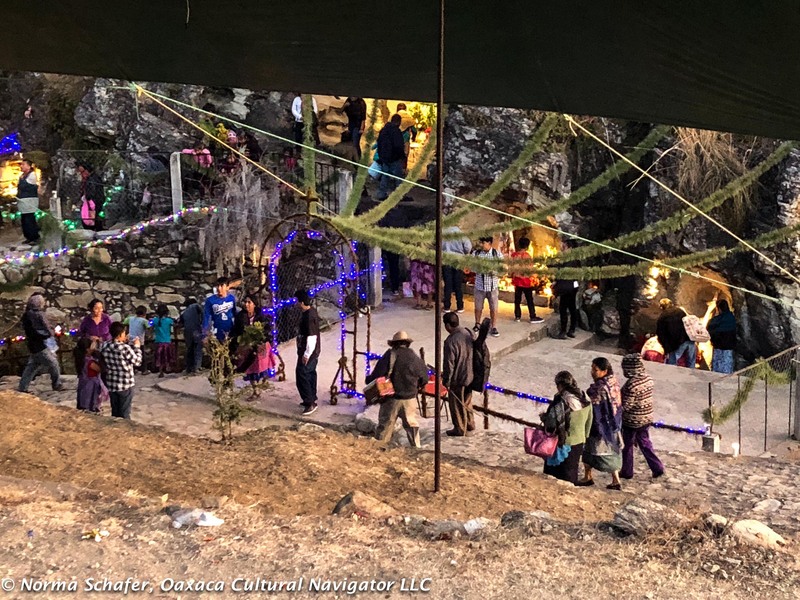 It is the third night, January 2, of a weeklong New Year’s observance practiced here in Teotitlan del Valle long before the Spanish Conquest. For the ancients, the moon set the calendar. A late December -early January super moon would have been an awesome sight thousands of years ago just as it is today. I arrive by 4:30 p.m. when it’s light enough to find a comfortable seat on a rock outcropping. I am intentionally alone to take in this environment where I live and to do my own meditation about the coming year with no distractions other than the landscape and my neighbors. The rock mountain has changed dramatically since I was here two years ago. In a beautification plan, I see the steep, stony hillside is planted with young trees struggling to survive this high desert terrain. The deep holes in which they are planted look like moon craters. Perhaps in ten years this will become a tree-shaded park filled with flowering Flor de Mayo and guaje trees. Ojala! This third night is less populated, more tranquil with fewer people. Families set up camp and convert the slope to a picnic ground. Some have tarp shelters or elaborate tents, sides tethered to ground with rocks gathered nearby. Ropes anchor tent to boulders. 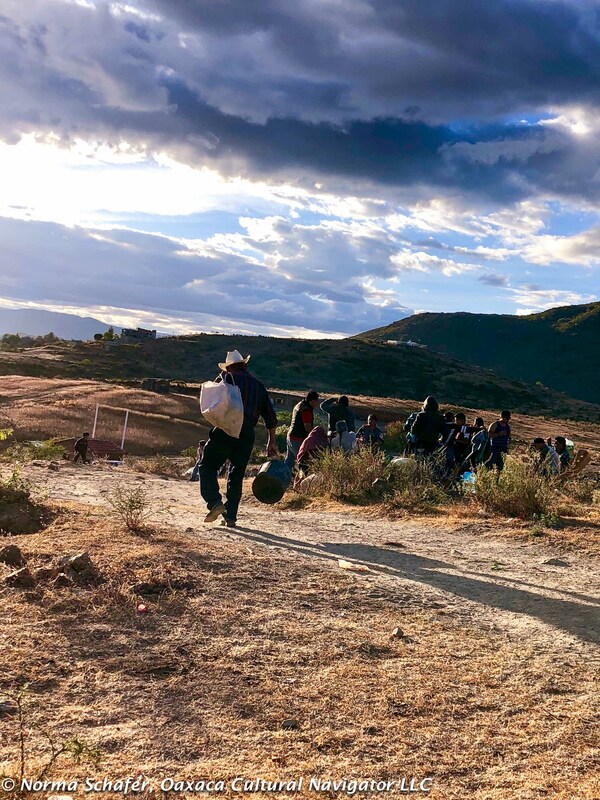 Children carry blankets, barbecue grills, wood, charcoal, a bag of meat to cook, a basket of mandarin oranges. I smell charcoal fires and gasoline, the strike of sulphur as a match lights. A wind whips up, carries smoke and cinder. Children hide their faces. So do I. Grandmothers, braids tied with crimson ribbon curl atop their heads like a crown, hover, tend to tender eyes. 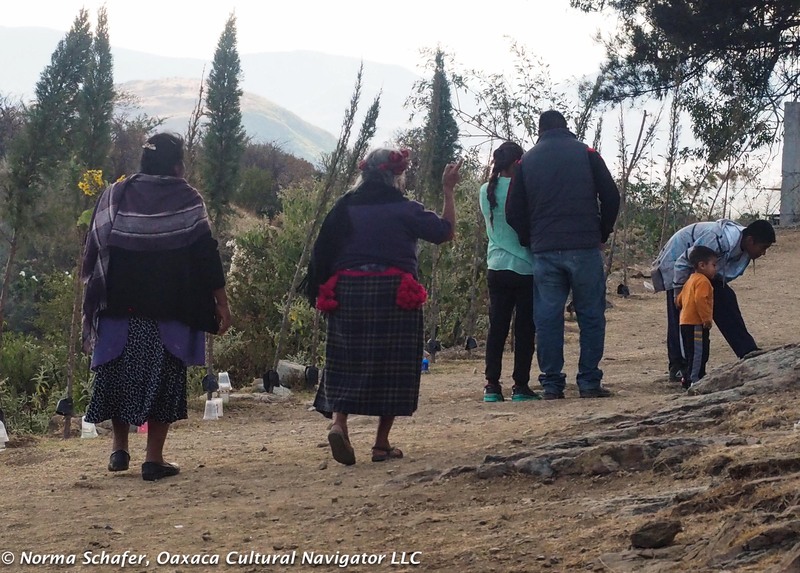 The language of Zapotec is spoken here. First language for first peoples. People I know and some I don’t, greet me with Feliz Año Nuevo, extend their arms in embrace and a pat on the back. Packing out the remains of a meal or an overnight stay? 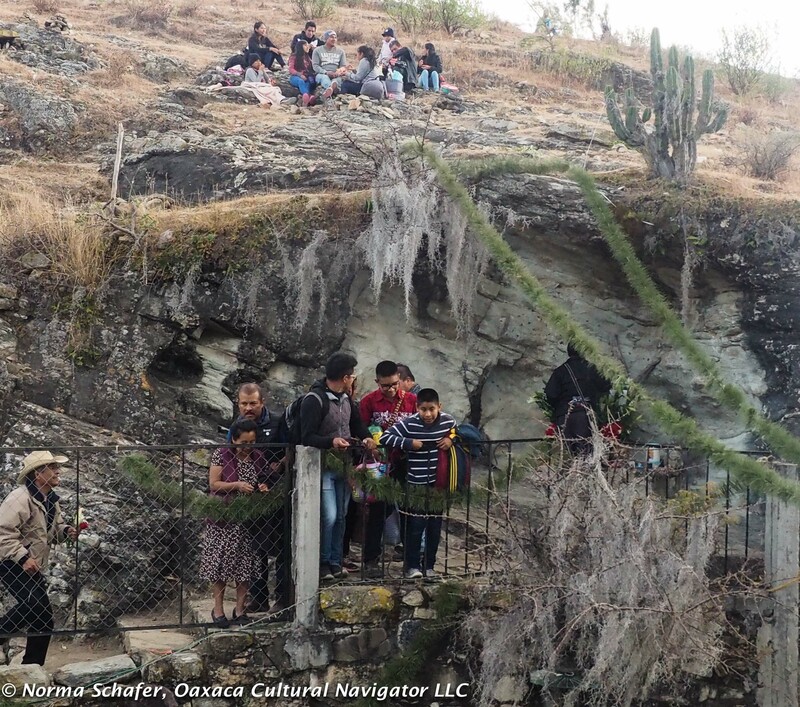 Las Cuevitas is the place to pray for a good year. Mostly, my friend Antonio tells me, people ask for good health. Nothing is more important, he says. In my personal world, God is universal and all human beings are good. 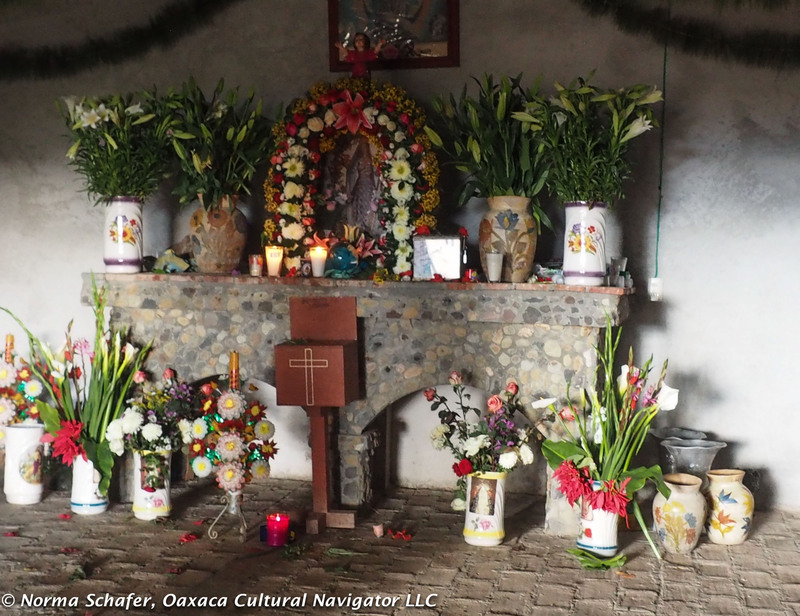 It is easy for me to be here, lay a coin on the altar of the Virgin of Guadalupe — Earth Goddess –and pray for a year of good health and contentment. We all deserve blessings. 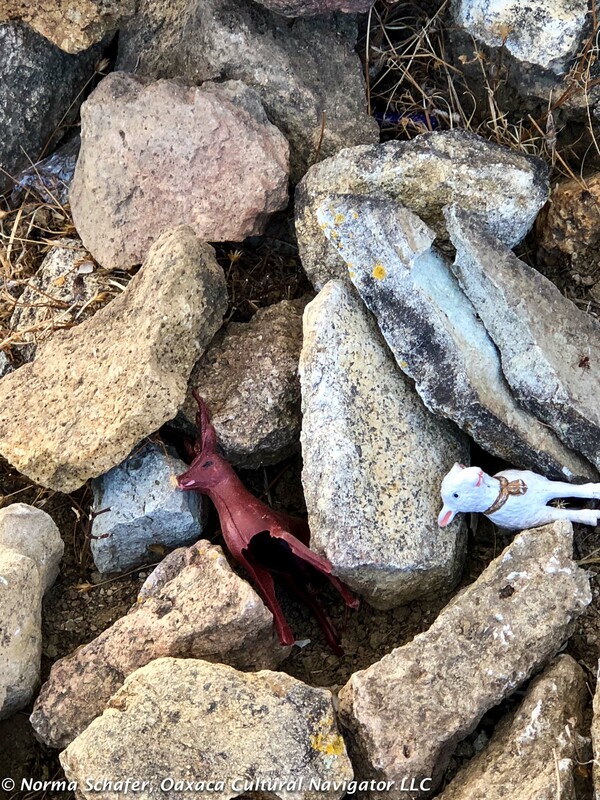 Along the rock hill, I see remnants of dreams constructed on the last two nights of the celebration with rocks, moss, fragrant greens, sticks. These are facsimiles of new houses, a second floor addition, a roof, a fence, a stockade for cattle or goats. Dreams come true if you come to Las Cuevitas and build a miniature. Mostly, it’s about family, intergenerational connection, integration, celebration. 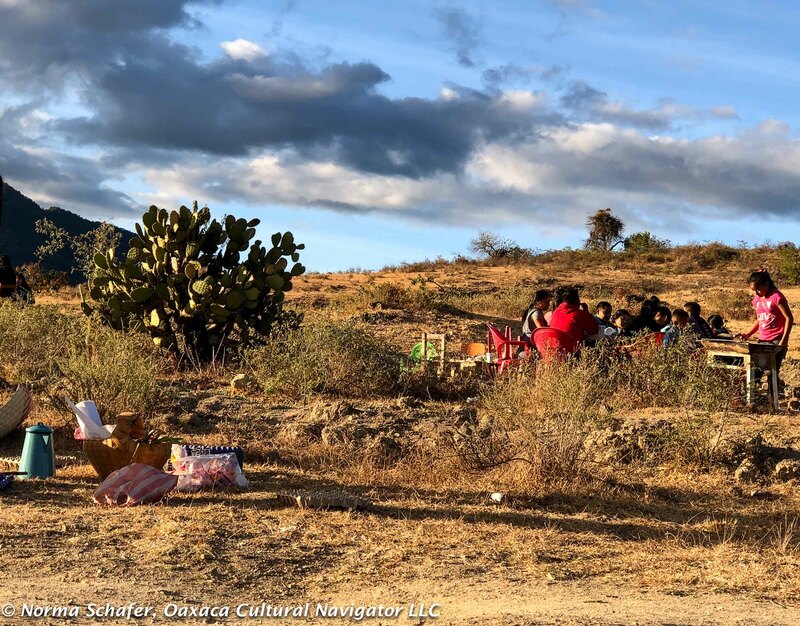 Gathering on the hillside to build together, eat together, pray together, play together. Cultural continuity and endurance prevails here despite intrusions from other worlds. It’s 5:30 p.m. and the sun glows through the clouds. I’m waiting for sunset at Las Cuevitas. Dry grasses wave. 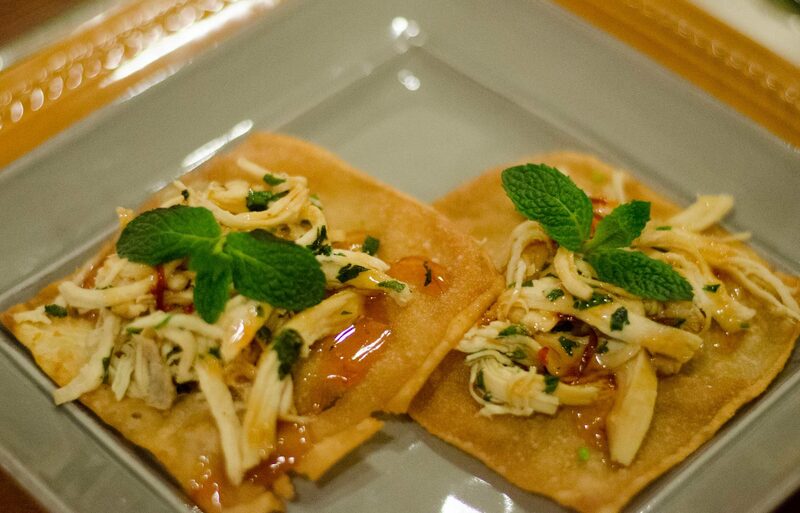 Firecrackers are lit and go skyward with a bang. All is illuminated. Beyond the caves, cows graze on the top of the opposite hill. Families continue to stream in. Women fan cooking fires. Men carry cases of beer, coolers of food. Soon after dark, young men will throw fireballs across the horizon, much like their ancestors did in a test of strength. 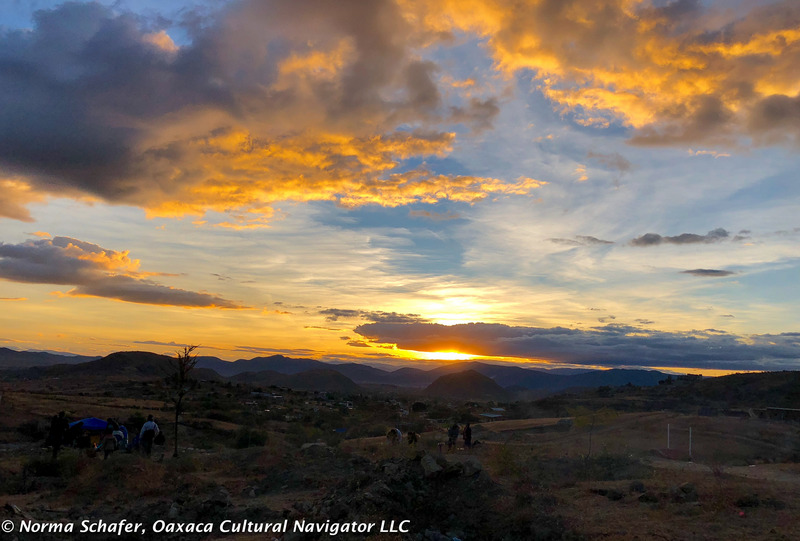 I stay until the sun dips into the Sierra Madre del Sur beyond the next village, Macuilxochitl. You can see their church in the distance. 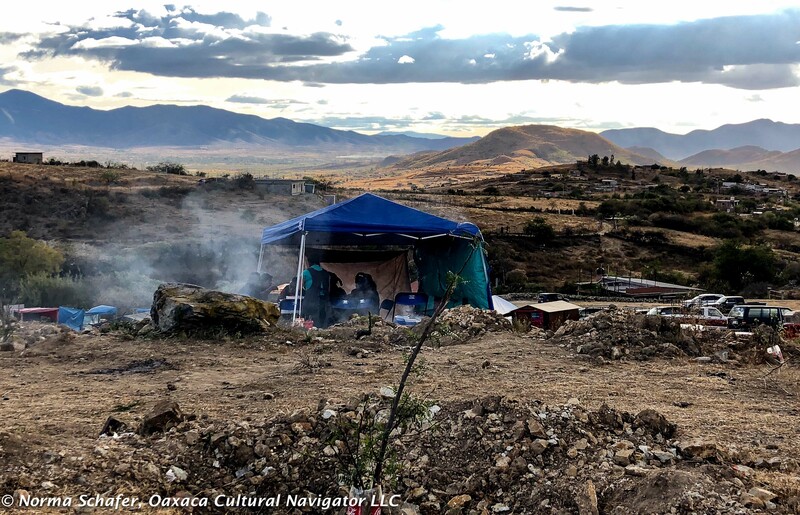 Under the mound that rises on the horizon is an unearthed Zapotec archeological site. As the sun vanishes, there is chill and I want to get down the rocky slope before the light dims and I can’t find my way. I want to remember the vast expanse of universe, the valley below, the magnificence of sun, moon, stars and the days that are a gift to make meaningful. We have THREE spaces open for February 13-22, 2018. We have ONE space open for February 27-March 8, 2018 for a shared room at $2,495. 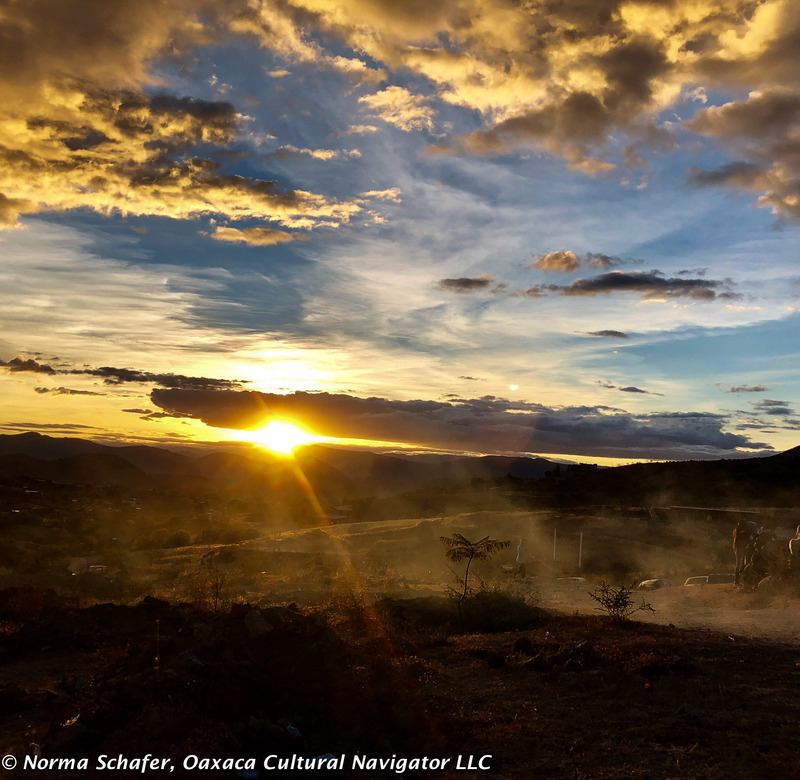 We are based in the historic Chiapas mountain town of San Cristobal de las Casas, the center of the Maya world in Mexico. 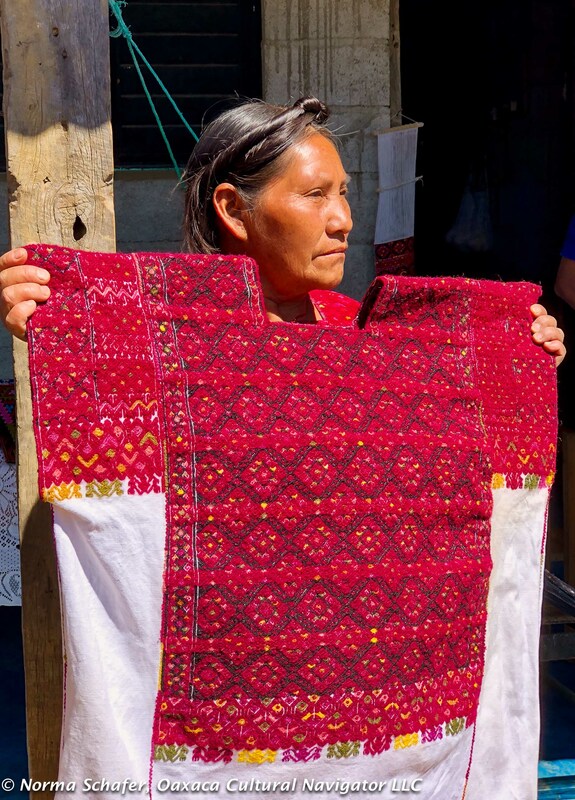 Here we will explore the textile traditions of ancient people who weave on back strap looms. 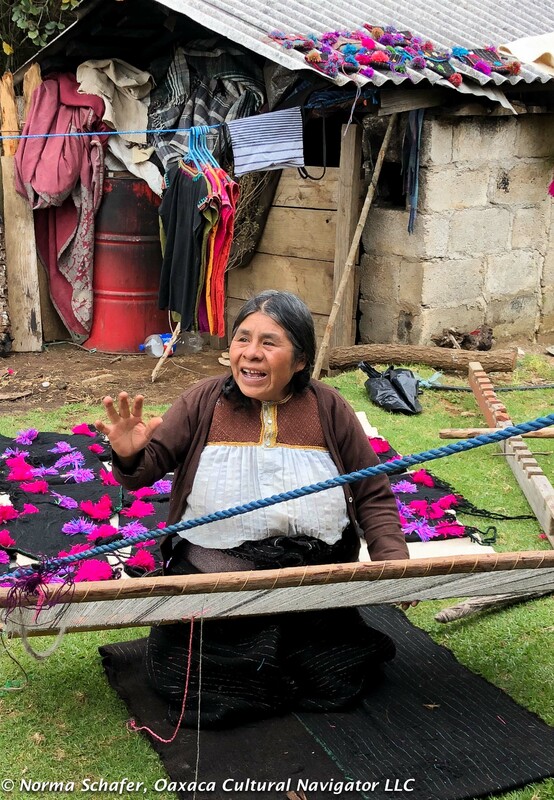 Women made cloth on simple looms here long before the Spanish conquest in 1521 and their techniques translate into stunning garments admired and collected throughout the world today. Colorful. Vibrant. Warm. Exotic. Connecting. Words that hardly describe the experience that awaits you. I am committed to give you a rich cultural immersion experience that goes deep rather than broad. We cover a lot of territory. 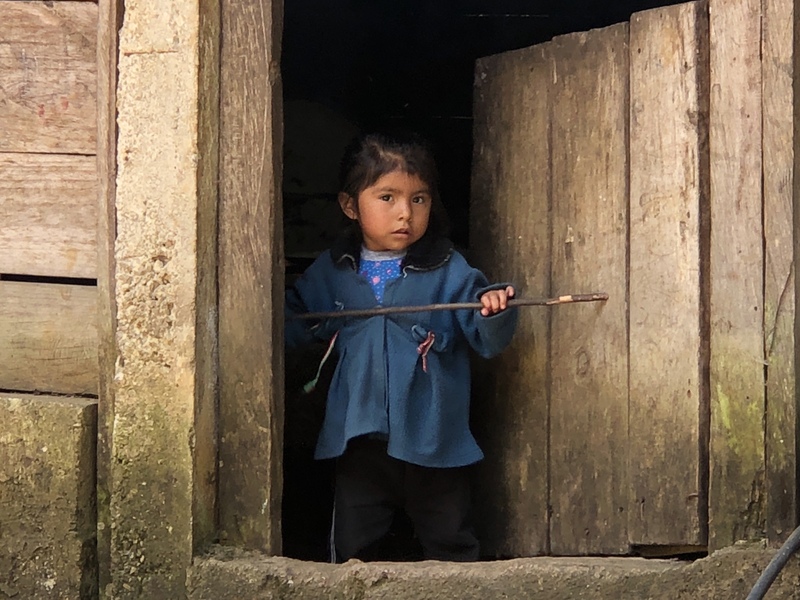 That is why we are spending nine nights in this amazing Pueblo Magico — Magic Town — to focus on Maya textiles and weaving traditions. 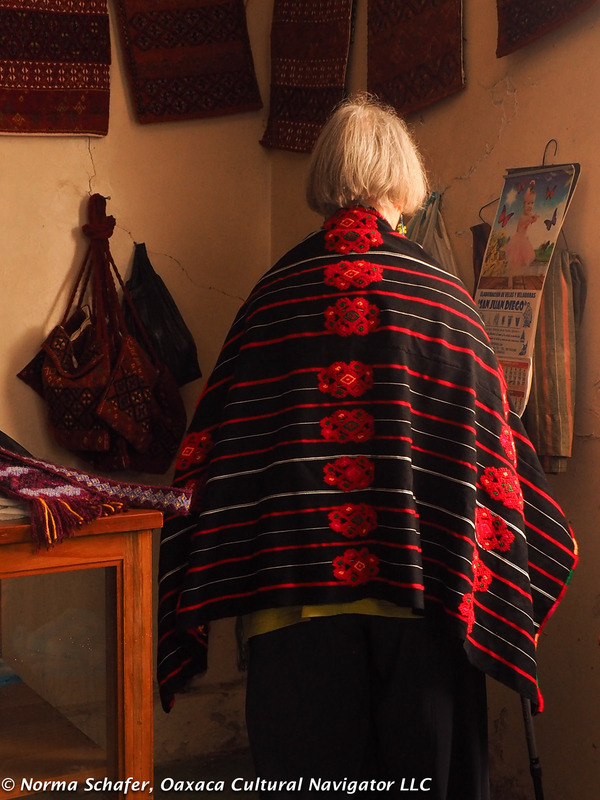 Our day trips will take us into villages, homes and workshops to meet the people who keep their traditions vibrant. 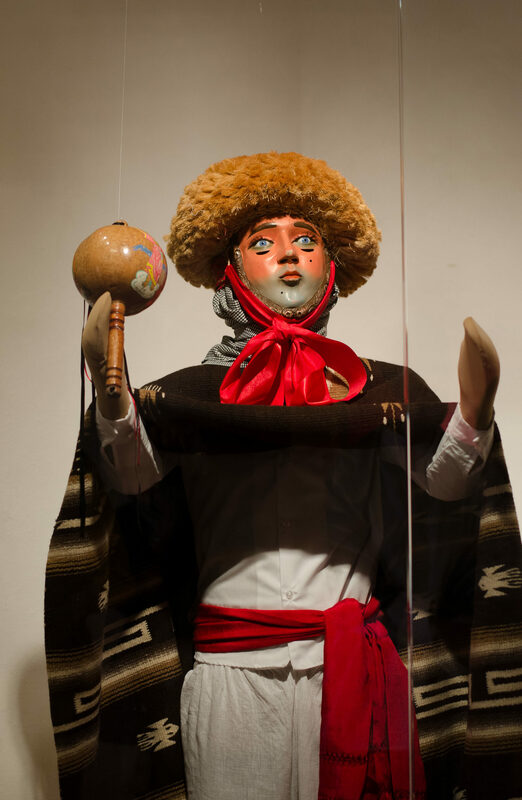 This is an interpersonal experience to better know and appreciate Mexico’s amazing artisans. I have invited textile collector Sheri Brautigam to join me to give you a special, in-depth experience. 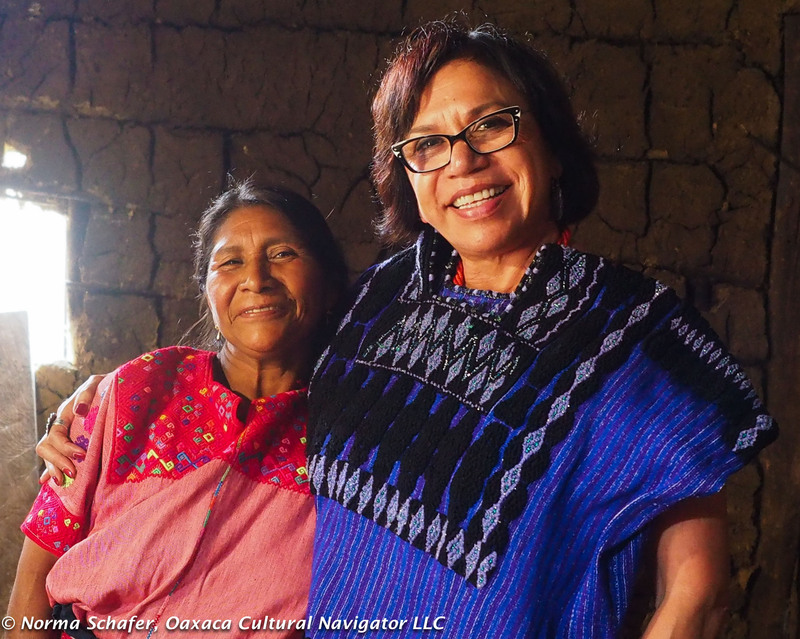 Sheri writes the blog Living Textiles of Mexico and is recognized for her particular knowledge of Chiapas Maya textiles. 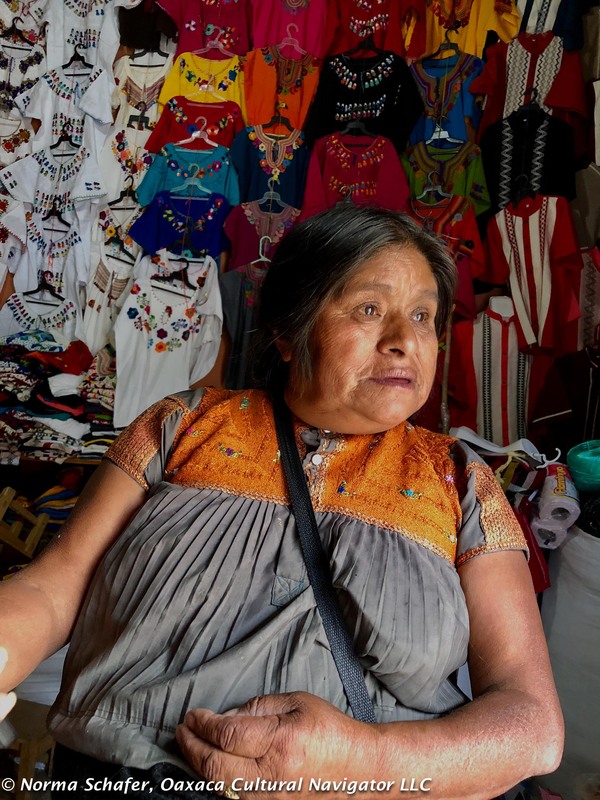 She is author of the Thrums Textile Fiestas of Mexico: A Traveler’s Guide to Celebrations, Markets, and Smart Shopping. 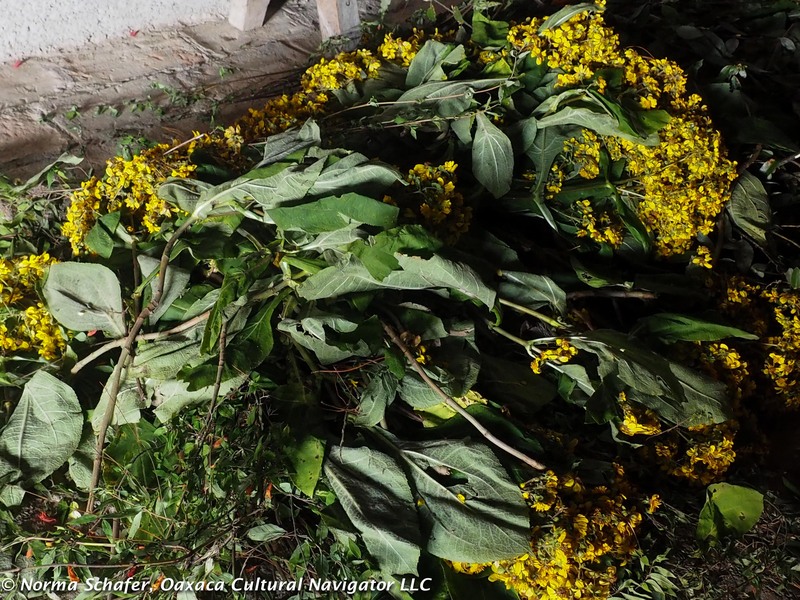 (I’ve contributed two chapters with photos, one for Tenancingo de Degollado and the other for Teotitlan del Valle!) Recommended reading for the trip! 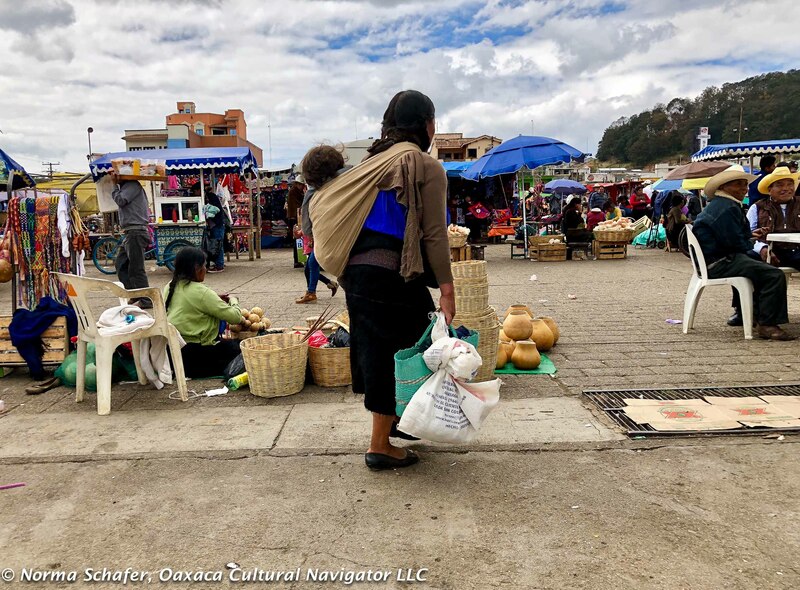 I have also engaged one of San Cristobal’s most well-informed guides, born and raised in San Cristobal, a fluent English-speaker who will travel with us to give bi-lingual services. His interest is in cultural anthropology and local history. 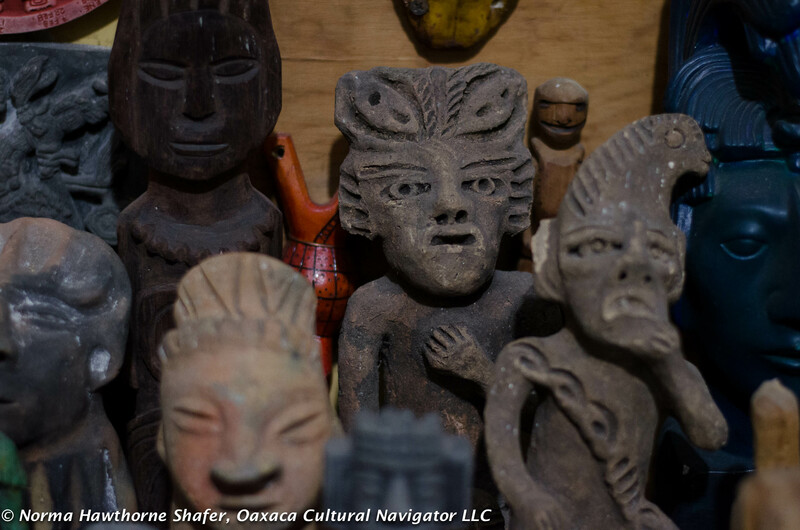 We will travel in a luxury Mercedes-Benz Sprinter van as we go deep into the Maya world. Tuesday, February 13/27: Travel day. 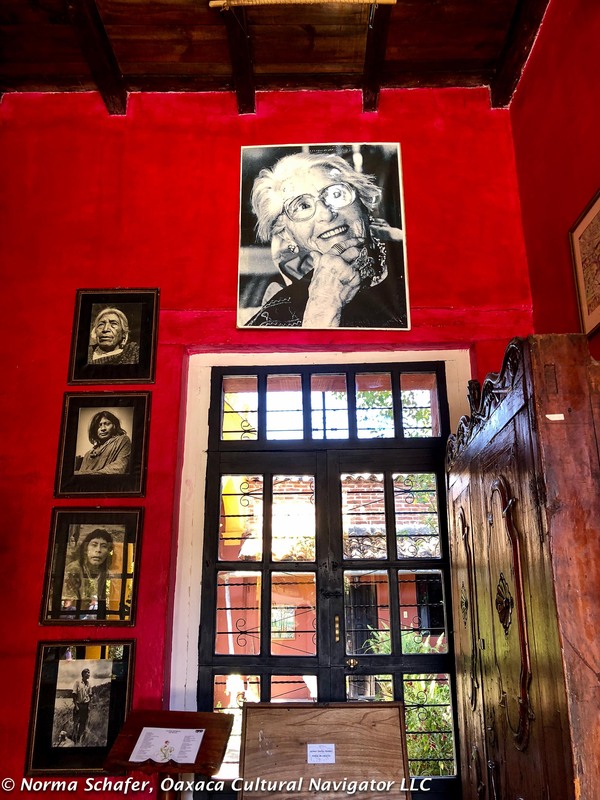 Arrive and meet me at our hotel in San Cristobal de las Casas. I will send you complete directions for how to get from the Tuxtla Gutierrez airport to our hotel. The airport is a clean and modern facility with straightforward signage. You will book your flight to Tuxtla from Mexico City on either Interjet or Volaris or Aeromexico. There are plenty of taxis and shuttle services to take you there. Cost of transportation (about $55USD) from airport to San Cristobal is on your own. Those who have arrived by dinner time can go out for an optional meal, on your own. 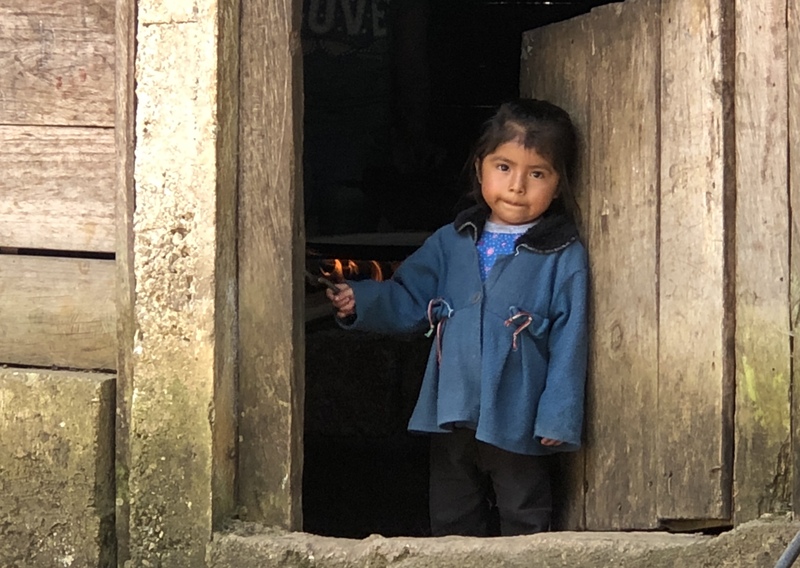 Thursday, February 15/March 1: Tenejapa is about an hour and a world away from San Cristobal de Las Casas. 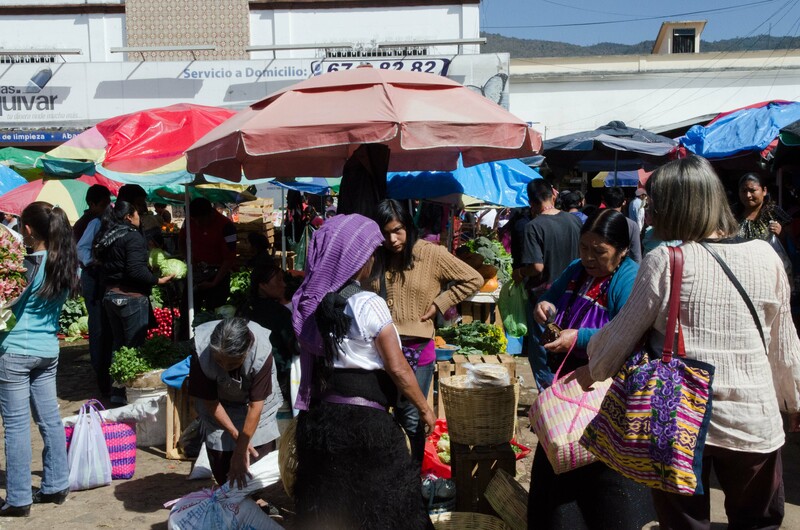 Today is market day when villagers line the streets filled with fresh fruits, vegetables, meats, and often textiles. We’ll meander the market to see what’s there. In years past, I’ve found some stunning shawls, huipils and bags here. 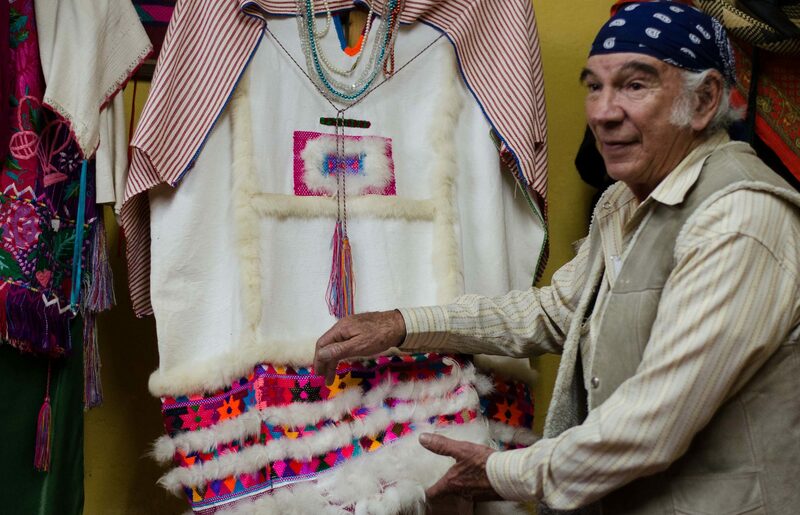 Then, we will visit the outstanding textile cooperative founded by Pedro Meza and his mother Doña Maria Meza Giron. 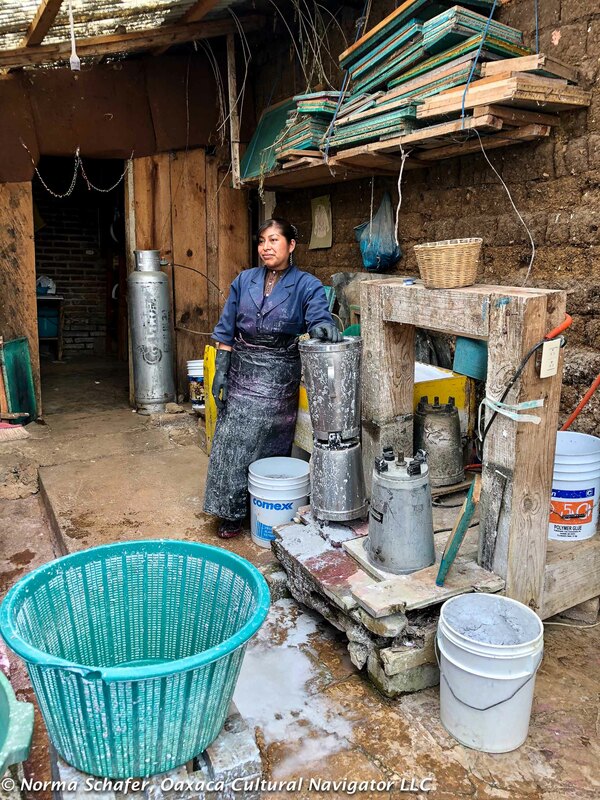 Saturday, February 17/March 3: Amantenango del Valle and Aguacatenango to see the whimsical and functional wood and dung fired pottery – the way its been done for centuries. 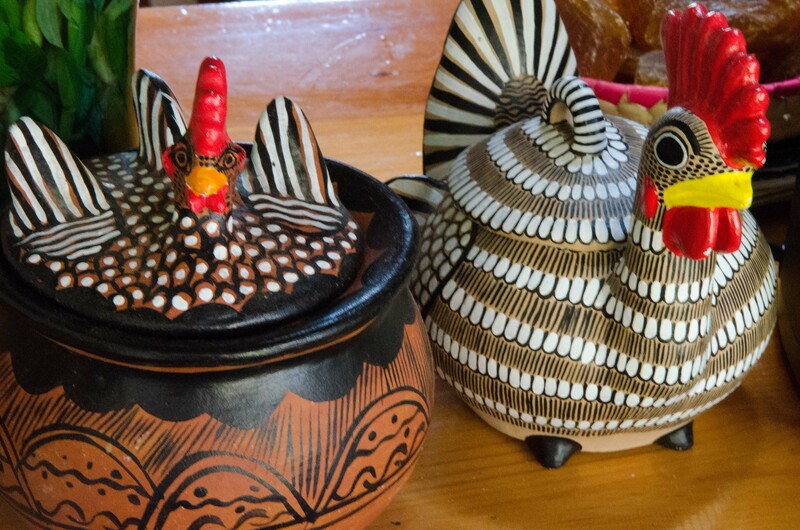 Wonderful roosters, spotted jaguar sculptures and ornamental dishes. This is a textile village, too, where women embroider garments with designs that look like graphic art. 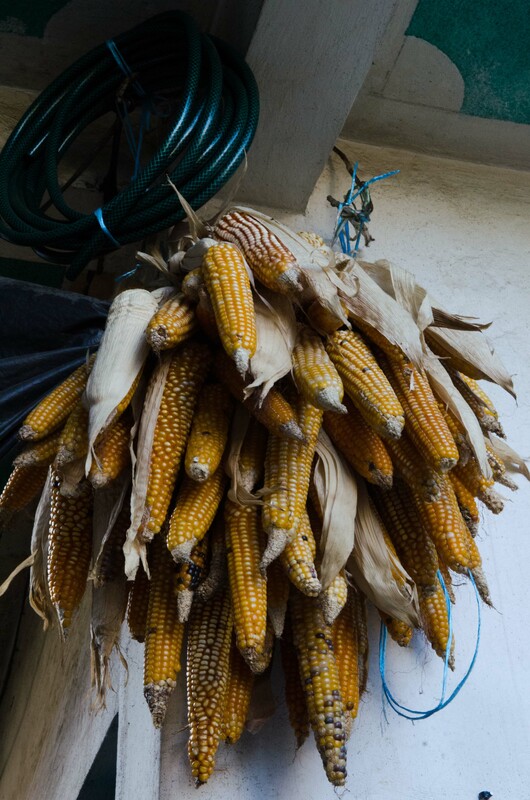 In neighboring Aguacatenango, we will pull up to the small zocalo in front of the church. Within moments, ladies with their beautiful embroidered blouses will appear. (B, L) Dinner on your own. Sunday, February 18/March 4: This is a big day! First we go to San Lorenzo Zinacantan, where greenhouses cover the hillsides. 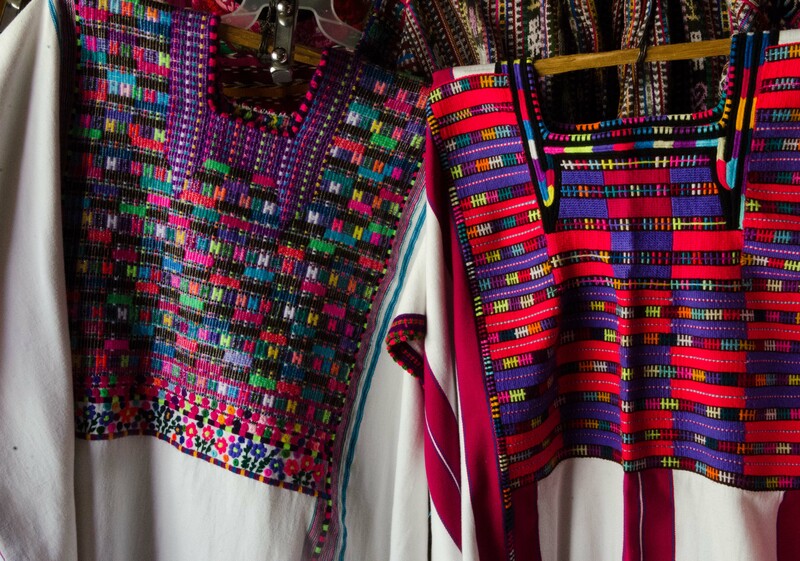 Here, indigenous dress is embellished in exquisite floral designs, mimicking the flowers they grow. First we visit the church, bedecked in fresh flowers. Then, we’ll meet weavers and embroiderers in their home workshops. 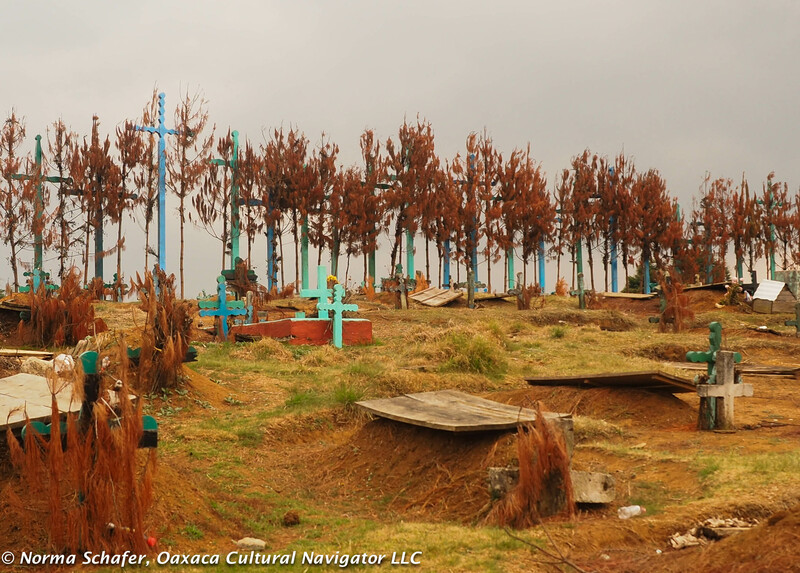 Next stop is magical, mystical San Juan Chamula where the once-Catholic church is given over to a pre-Hispanic pagan religious practice that involves chickens, eggs and coca-cola. 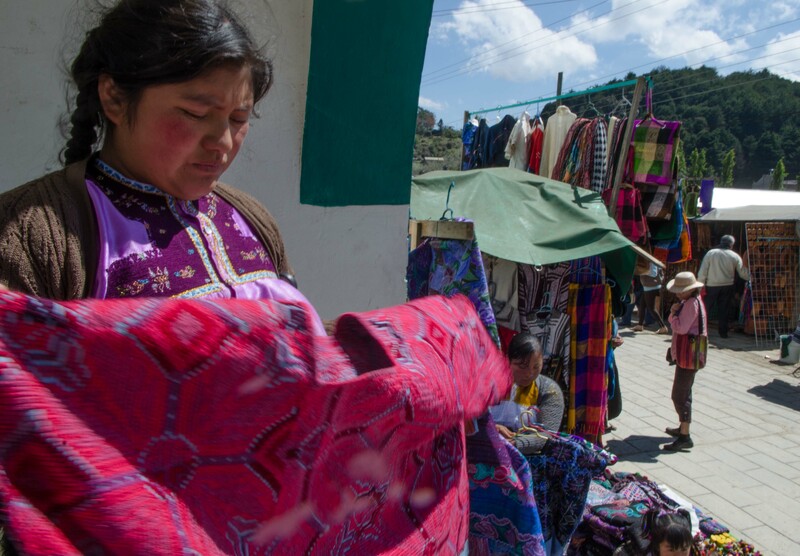 We’ll roam Chamula’s abundant textile market, compare and contrast fabrics and designs. 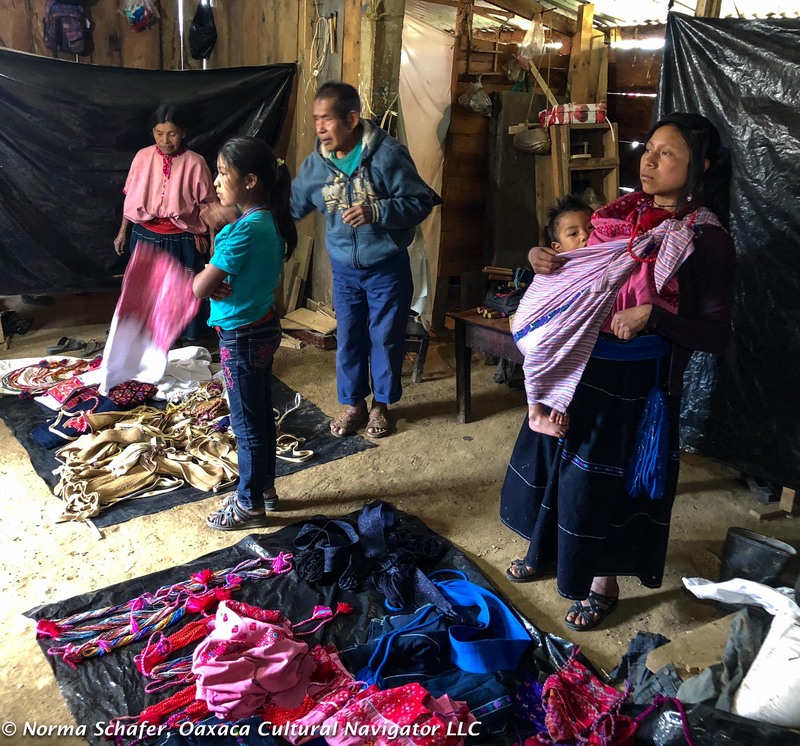 We will then continue on up another mountain to visit Maruch (Maria), a Chamulan woman in her rural home surrounded by sheep and goats. 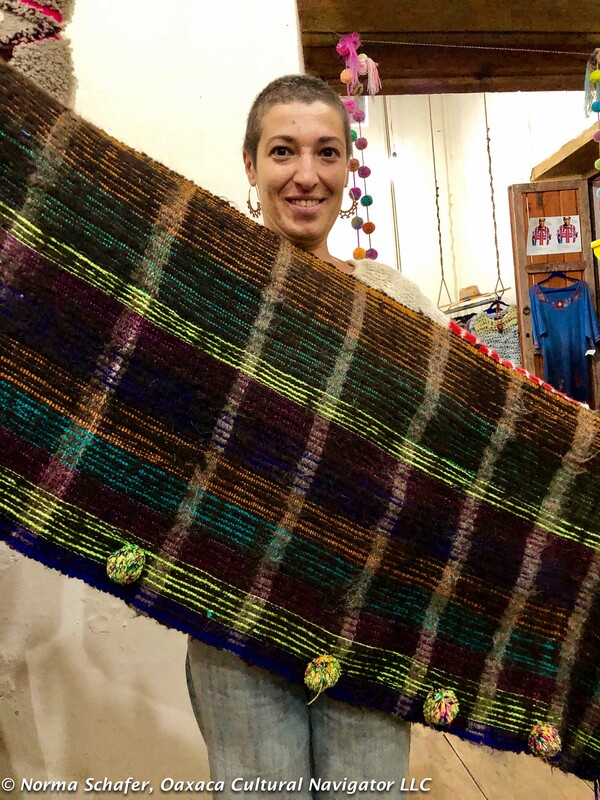 She will demonstrate back strap loom weaving and wool carding, and how she makes long-haired wool skirts, tunics and shawls. Perhaps there will be some treasures to consider. (B, L) Dinner on your own. Thursday, February 22/March 8: Depart. 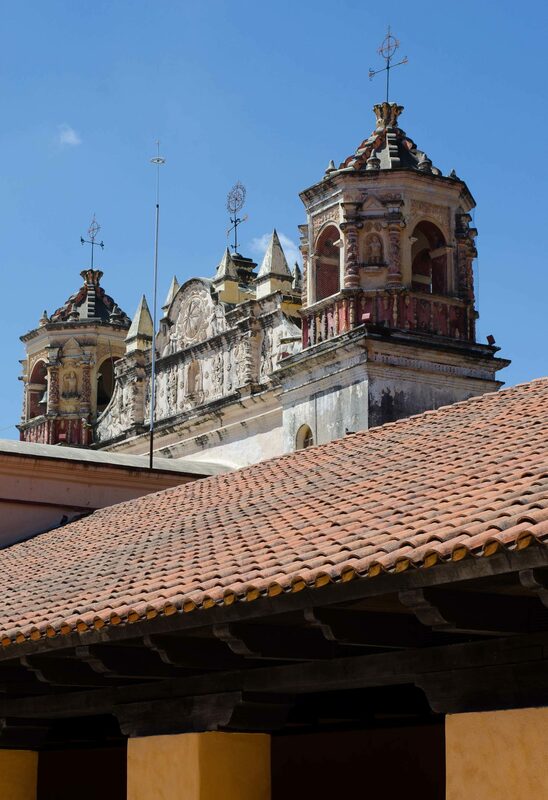 We will coordinate departures with included van service from San Cristobal de las Casas to the Tuxtla Gutierrez airport. Please schedule your flight departure time for mid- to late afternoon. 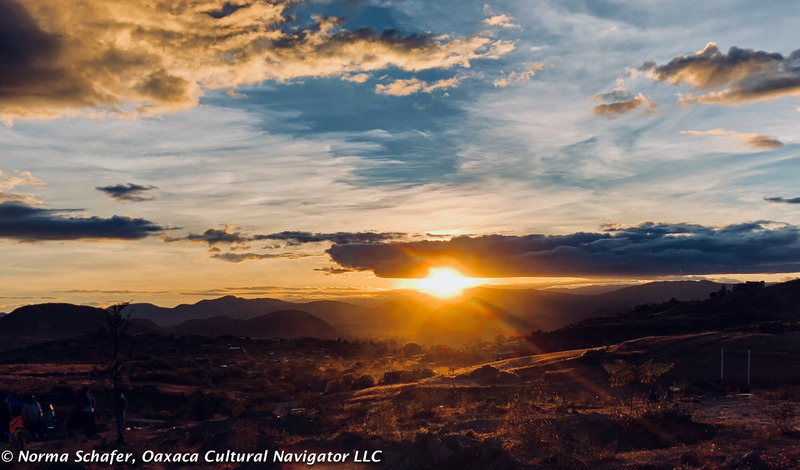 You will connect from Tuxtla to Mexico City and then on to your home country. If you are going from Tuxtla to Oaxaca, you can fly direct on AeroMar. We will coordinate departure times and your trip will cover the cost of transportation from the hotel to the airport. The workshop does NOT include airfare, taxes, tips, travel insurance, liquor or alcoholic beverages, some meals, and local transportation as specified in the itinerary. We reserve the right to substitute instructors and alter the program as needed. How to Register: Send an email to Norma Schafer. Tell us if you want a shared/double room or a private/single room. We will send you a PayPal invoice that is due on receipt. Reservations and Cancellations. We accept payment with PayPal only. We will send you an itemized invoice when you tell us you are ready to register. After December 15, 2017, refunds are not possible. You may send a substitute in your place. If you cancel on or before December 15, 2016, we will refund 50% of your deposit. 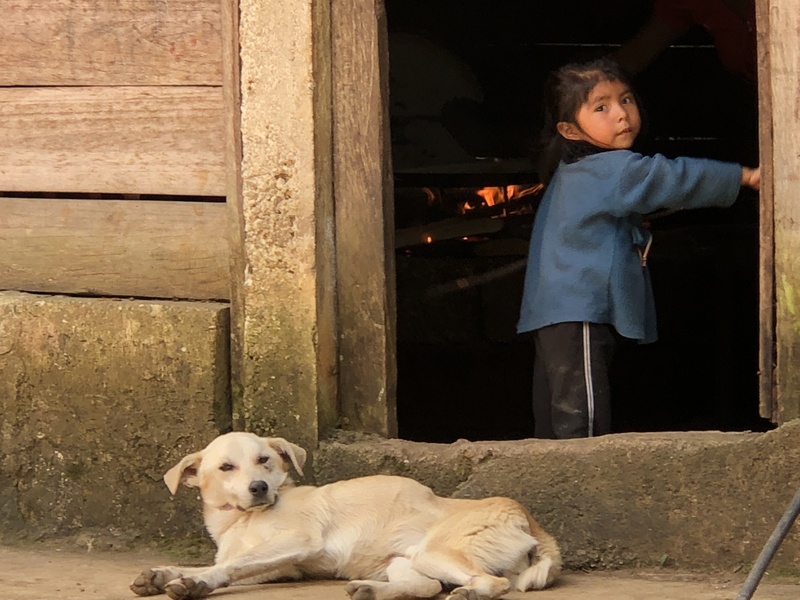 Terrain, Walking and Group Courtesy: San Cristobal de las Casas is a hill-town in south central Chiapas, the Mexican state that borders Guatemala. The altitude is 7,000 feet. Streets and sidewalks are cobblestones, mostly narrow and have high curbs. The stones can be a bit slippery, especially when walking across driveways that slant across the sidewalk to the street. We will do a lot of walking. Being here is a walker’s delight because there are three flat streets devoted exclusively to walking. If you have mobility issues or health/breathing impediments, please let me know before you register. This may not be the study tour for you. 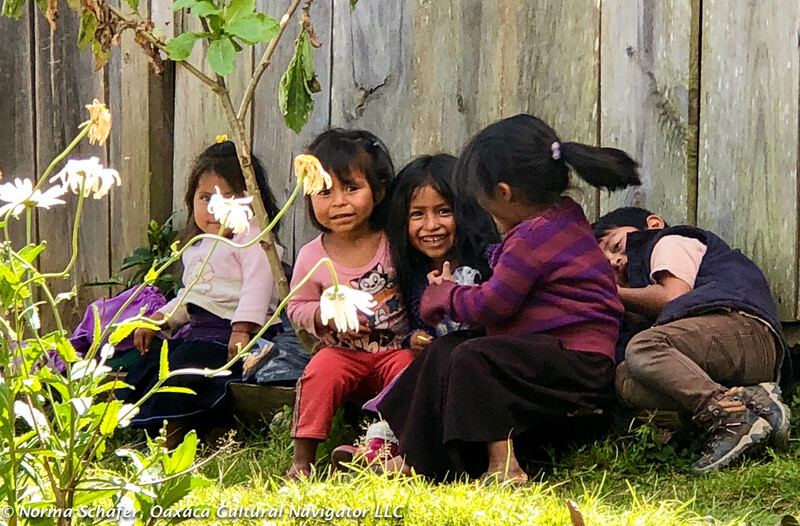 Traveling with a small group has its advantages and also means that independent travelers will need to make accommodations to group needs and schedule. We include plenty of free time to go off on your own if you wish. Required–Travel Health/Accident Insurance: We require that you carry international accident/health/emergency evacuation insurance. Proof of insurance must be sent at least 30 days before departure. 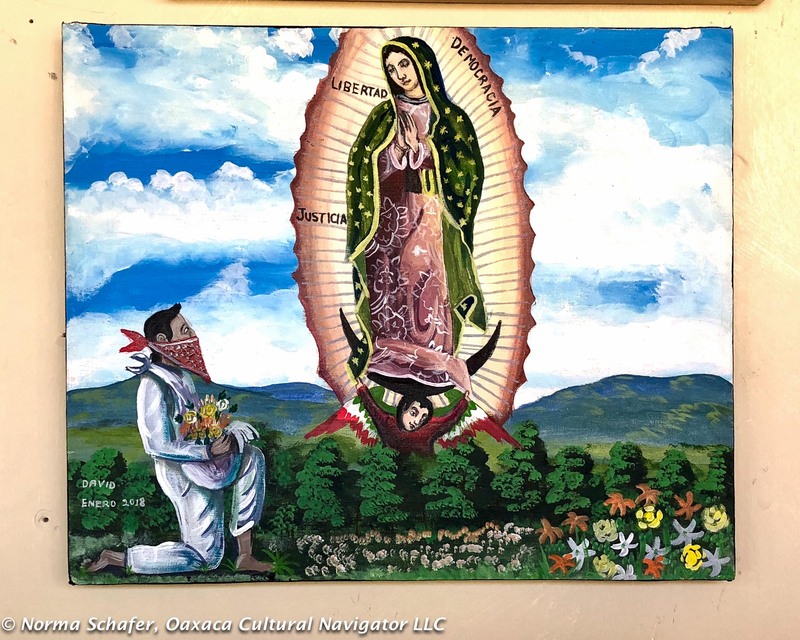 In addition, we will send you by email a PDF of a witnessed waiver of responsibility, holding harmless Norma Schafer and Oaxaca Cultural Navigator LLC. We ask that you return this to us by email 30 days before departure. Unforeseen circumstances happen! Be certain your passport has at least six months on it before it expires from the date you enter Mexico! Plane Tickets, Arrivals/Departures: Please send us your plane schedule at least 30 days before the trip. This includes name of carrier, flight numbers, arrival and departure time from San Cristobal. Workshop Details and Travel Tips. Before the workshop begins, we will email you study tour details and documents that includes travel tips and information. To get your questions answered and to register, contact Norma Schafer. 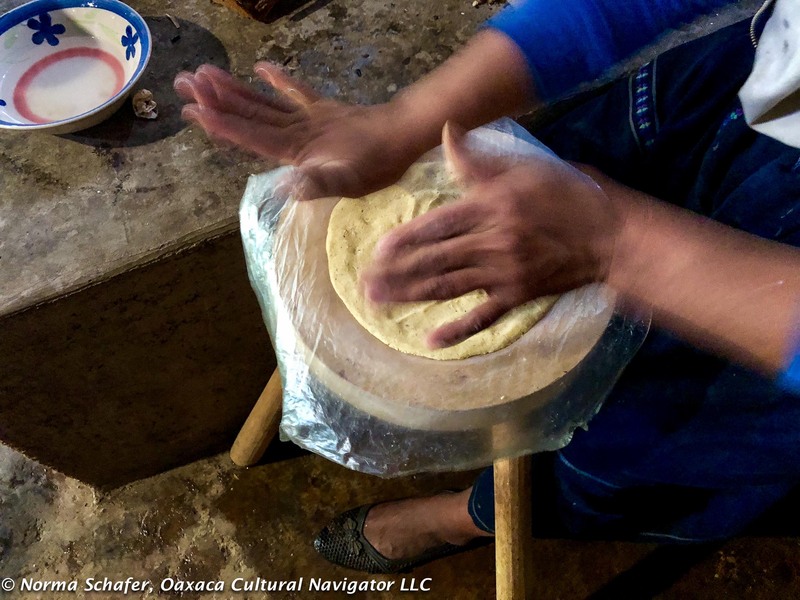 This retreat is produced by Norma Schafer, Oaxaca Cultural Navigator LLC. We reserve the right to make itinerary changes and substitutions as necessary.